Will president's pledge unlock PPA jam? SOUTH AFRICA: Political turmoil and the state utility's heel-dragging on renewables development are stifling wind-power growth in one of the world's most promising markets. But the president's promise to force Eskom into action has raised hope of breaking the deadlock. South African president Jacob Zuma's state-of-the-union address on 9 February started over an hour late. 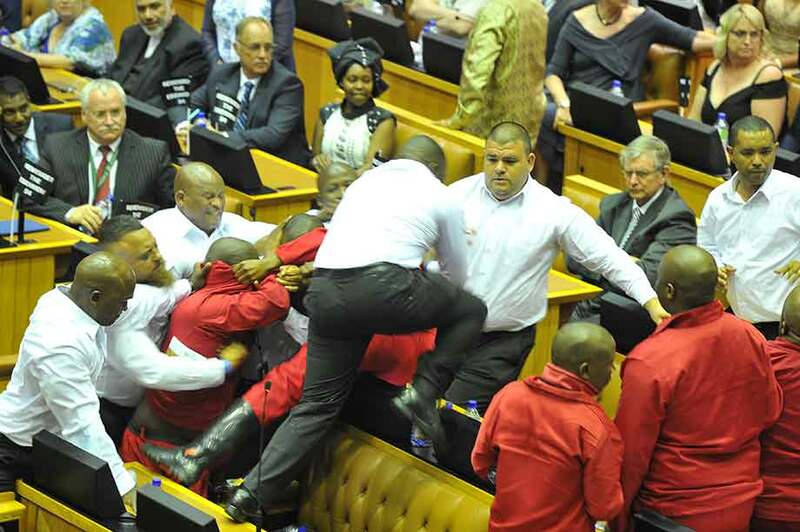 Opposition MPs held up proceedings, first by throwing corruption allegations at him, and then throwing punches at members of his government. Footage of the brawl was broadcast around the world. Zuma did finally get to make his speech, and it contained the words the country's wind-power developers were desperate to hear: a clear promise to force public utility and grid operator Eskom to sign a 2.38GW backlog of renewable power purchase agreements (PPAs), nearly 1.4GW of which relates to wind projects. All the projects had won rights to PPAs through the third and fourth rounds of the Department of Energy's (DOE) rigorous renewables bidding process. South Africa had been globally heralded as a star of emerging wind markets, but progress came to an abrupt halt in mid-2016 when Eskom refused to sign any further PPAs. Contentiously citing excessive costs of renewables capacity, Eskom said in May it would wait for government guidance before unblocking pending PPAs. Zuma has now provided that guidance. "Easier said than done," is the reaction of Joffrey Dupuy, a regional analyst at global energy consultants Make. "The president did not provide any details on the timeline regarding the resolution of the problem." Brenda Martin, CEO of the South African Wind Energy Association (SAWEA), takes a more positive view while admitting that the political mayhem hardly inspires confidence in the administration. "It's not every day a president issues such direct support for a sector," she says. "It's no small deal." Eskom told Windpower Monthly in early March that it had approved the backlog in renewables PPAs, including nearly 1.4GW for wind. Eskom insisted its investment and finance committee and the public enterprises minister have approved the PPAs, and that regulator Nersa "has provided assurances for (PPA) cost recovery". Martin, however, remains sceptical. She says the Independent Power Producer's Office — the watchdog for power contracts — had registered no change to the hiatus. "More smokescreen from Eskom," she says. Longer-term policy supports wind power. Prior to Zuma's address, the DOE had completed a draft integrated resources plan (IRP) - South Africa's infrastructure road map — which signals the need for around 37GW of cumulative wind capacity to 2050. That builds on 2010's IRP, which envisaged 8.4GW of wind to 2030. South Africa has "little choice" in the matter, argues Martin. "Renewables is the only way to deploy cost-effective power rapidly, shoring-up a weak grid plagued by load shedding, while supporting local communities." She accuses Eskom of a smear campaign, deliberately exaggerating wind-power prices by citing those from earlier power auctions rather than today's much-reduced going price. Martin's argument is supported by a report from national watchdog the Council for Scientific and Industrial Research (CSIR). This states that wind power's average auction price fell from ZAR 1,510/MWh ($115/MWh) in Round 1 (2012) to ZAR 620/MWh ($48/MWh) in Round 4 (2015). That makes wind 40% cheaper than new coal, and more than 50% cheaper than older coal-fired generation, according to the CSIR. Solar PV prices have fallen even faster — from ZAR 3,560/MWh to ZAR 620/MWh in the same period. Eskom appears more interested in kick-starting a 9.6GW nuclear programme, for which it says 27 firms are responding to a request for information. But the CSIR's findings of ZAR 1,300/MWh for nuclear generation provide another reason why it would be politically foolish to continue blocking wind power, says Martin. SAWEA estimates the PPA blockage is holding up ZAR 50 billion in investments, roughly half of which is for wind power. With around half of renewables investments sourced locally - a cornerstone of South Africa's renewables programme - that is a big deal for local communities and jobs. 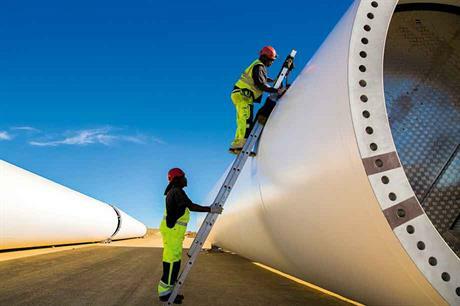 But the present-day reality is decelerated wind-market growth, with just 433MW of new capacity connected in 2016, according to SAWEA, compared with 483MW in 2015 and 555MW in 2014. Cumulative capacity at the end of last year stood at 1,471MW across 19 projects. "We remain cautious about the shortto medium-term development and do not expect the president's stated commitment to ensuring PPAs will go through to solve all the problems," says Dupuy. Make expects more tempered growth in the medium term, estimating around 5.5GW of wind capacity to 2025 to reach 7GW in total. This represents an annual rate of build of just under 700MW; below expectations in 2015, when 1.2GW annually was expected for 2016-2020. SAWEA sees steering wind power back on course as a lengthy process requiring consistency. Despite the seemingly fast deployment in 2014-2016, South Africa's renewables framework itself, the renewable energy independent power producers procurement programme (REIPPPP), took over two years to draft and approve. The REIPPPP initiated a process of competitive bidding in 2012, largely aimed at ending outages, load shedding and dependency on the 34GW of coal capacity, which supplied 88% of all electricity consumption. Its exacting demands on project and developer viability provided solid assurances to investors and financers. The bidding process allocates successful developers the right to finalise a 20-year PPA with Eskom. The REIPPPP has already finalised five calls for bids (rounds 1-3, 3.5 and 4), procuring a total of 6,376MW across wind, solar and biomass, according to figures from state regulator Nersa. Eskom has signed PPAs on just over 4GW across 64 sites, with 2,738MW of renewables online at the end of 2016. The 36 projects pending PPAs, all but one from round 4, amount to 2.38GW, 1.4GW for wind. "Even if pending PPAs are signed in the second quarter, a minimum of one year needs to be added considering construction time, resulting in projects not being commissioned before mid-2018," says Dupuy. Round 5, which was to call for 1.8GW of renewables capacity, has been on hold since May 2016, producing even more delays in new capacity deployment. No figures have been set for subsequent rounds. In the longer term, however, Dupuy sees a continued future for South African wind. "Large and well-spread wind resources combined with continuously decreasing costs in renewable energy allows the country to produce power at a low price," he says. SAWEA believes the sector is more than primed to get back into overdrive. Since 2012, global and local industrial players and investors have responded to REIPPP's long-term assurances. Developers include Ireland's Mainstream Renewable Power, which created a joint venture last year with global energy investors Actis. The partners commissioned the 80MW Noupoort wind plant in the Northern Cape last summer, bringing its online wind capacity in the country to 118MW. They have a further 280MW of wind capacity building and were awarded the 137MW Kangnas and 110MW Perdekraal East in round 4. Italy's Enel Green Power (EGP), commissioned its 88MW Nojoli wind plant in Eastern Cape in October 2016 and is currently building the 111MW Gibson Bay project. EGP was allocated 275MW in round 4, across the Soetwater (139MW) and Garob (136MW) projects. Chinese utility Longyuan and France's EDF also have major project stakes, as do Spain's Acciona, as well as other global developers, and even Eskom itself. SAWEA wants immediate action to prevent wind-factory closures. Tower and blade factories are now completing orders for round 3, Martin says. DCD Wind Towers, near Port Elizabeth, says it cannot rule out liquidation due to empty order books for round 4. "Developers are also struggling," says Martin, explaining the bidding process requires financial guarantees and that, besides hiring staff in preparation, they have also put money aside. "And money costs money," she says. Since Zuma's promise, industry signals have been mixed. Eskom said its investment and finance committee had approved all 2.38GW of outstanding PPAs, pending developer signature. Yet trickery is suspected. Before the PPAs are signed, developers need to negotiate so-called "budget quotes" with Eskom. The quotes are Eskom's calculation of the costs that developers must pay for new power lines and related infrastructure to interconnect their wind projects. Eskom's budget quotes "seem to be vastly exaggerated, more than doubling expected costs", confided one developer adviser, suspecting the utility of delaying tactics. The coming months will tell.